While the original Rhythm Tengoku didn't sell very well in Japan, a statistic that likely contributed to the game never getting an overseas release, Nintendo's President Satoru Iwata stated that the game has a very good commercial reception by consumers. With Nintendo looking for franchises to be given a second chance on their new handheld platform, Rhythm Tengoku seemed like a natural fit. The game follows its predecessor's structure of having four different games in set blocks with a remix mode at the end that combines elements of the aforementioned mini games. Along with bumping up the number of mini game sets from eight to ten (fifty mini games in total but some of the later games are themselves remixes of individual games), the big change is the way the games are played. 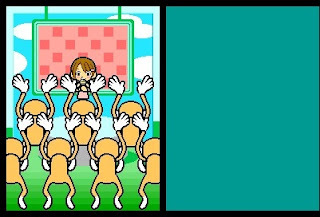 Rhythm Heaven puts the DS's features to full use in its games. The entire game is controlled with the touch screen (There's one game which involves the R button but it's minuscule in comparison to the rest of the game) and it makes great use of it with the controls feeling natural in the context of the game. As an example, the very first game puts you in control of a mechanical arm that has the ability to push pins across a straight line like a gun firing a bullet. 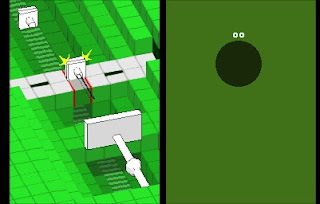 Two squares with holes appear from either side of the machine with both of them overlapping the gun at the same time. The game tells you this occurs in the So part of the Do-Re-Ma-So-La-Ti-Do sequence. After this piece of knowledge there is no further need for a tutorial and you are tasked with firing the beg when the two holes cross at the right time. This mini game serves double-fold as an introduction to the game as well as being a microcosm of everything to come. You learn what the game requires from you when it changes the tempo and you have to keep up your timing as a consequence. At a later point the whole screen turns black except for a tiny point of light where the line sight of your gun meets up with the intersection of the holes. 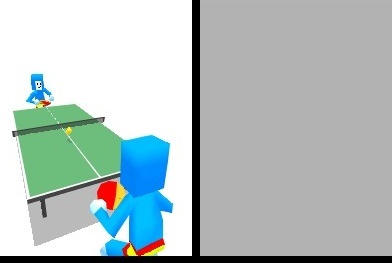 This demonstrates the key feature of the Rhythm Tengoku franchise that causes it to excel over many other games in the rhythm genre: the ability to play the game through rhythm alone. Going back to my talk of DDR in the previous review, in DDR the only way you would be able to complete the game through rhythm alone would be to memorise the dance patterns in sets to the rhythm of the music. While this style isn't inherently a bad thing, there's a hue of falsehood to it as you are not necessarily dancing to the music but dancing to a progression that coincidentally has a song playing in the background. the Guitar Hero/Rock Band model does this better as you have physical feedback from the equipment to attempt to replicate the melody however it still feels like an arbitrary progression. Rhythm Heaven on the other hand creates a perfect marriage of the music and the game play where the player is the medium to reiterate the music that the game is producing back into the game in a continuing cycle that's only byproduct is fun. In my Rhythm Tengoku GBA review I said that I consider the GBA original to be better than the DS version. After having replayed the DS version I still think this is true, the mixture of mini games is a lot less consistent than the original varying from neat distractions to flawed masterpieces and while the control system is definitely more suited to a rhythm game, the GBA version does seem to shine in its minimalism while the DS game makes a great effort to transfer that effect to the DS hardware. The sequel Rhythm Heaven Fever is out now in North America and is being released soon in Europe and since Rhythm Heaven is the only game in the series to be previously released in English there's not better time to try it!